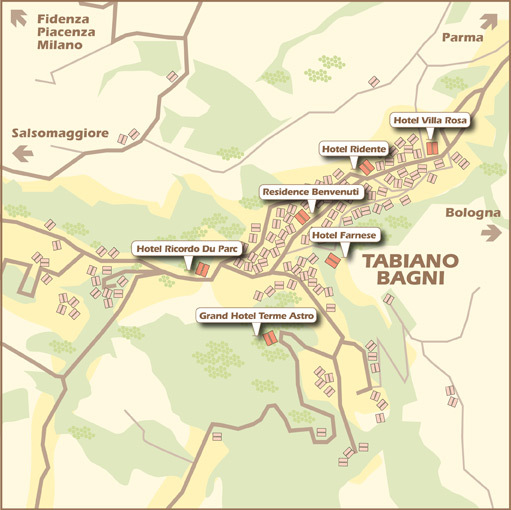 The Terme Village is made up of a circuit of five hotels. Here, the guests can choose between different types of services and make use of the amenities found in each hotel, such as the panoramic swimming pool, where one can admire striking sunsets, or the spa centre with its beneficial local sulphureous waters. The Grand Hotel Terme Astro is the jewel in the Terme Village's crown, a four star resort with 115 rooms. The hotel is open all year round and hosts a conference centre and a luxurious beauty farm nestled within a park of ancient oaks and horse chestnut trees. Perfect for conferences, work meetings, team building sessions, this hotel near Parma has 11 conference rooms with a maximum capacity of 800 places. Each room is fitted out with modern audio and video systems and internet connections. For large events, guests can stay in the Grand Hotel Terme Astro or in the other connected accommodation facilities. In line with the philosophy of “business&wellness” which marks out this resort, the Alhambra beauty farm opens its doors to the guests after a hard day's work, giving them the chance to enjoy moments of wellness in the hammam rooms and the spaces dedicated to massages and the numerous beauty treatments.